Click here to pre book. This project has been supported through the Micro Grant Programme, and the Touring Cinema Fund. THE STORY:After the release of Jake Blues from prison, he and brother Elwood go to visit "The Penguin", the last of the nuns who raised them in a boarding school. They learn the Archdiocese will stop supporting the school and will sell the place to the Education Authority. Three years old and doing better every year! Can you believe that Portrush Film Theatre is 3 years old? Seems like no time at all since a group of us got together and put £10 each into a kitty to be used for showing films in The Playhouse on a regular basis. Since then we've shown dozens of films, comedy, documentary, classic, new releases and locally made features. We are a small group of dedicated volunteers who happily work hard to keep showing films. Perhaps you want to know more about us or would like to get involved? Come to our 3rd AGM on Thursday 5th October at 7pm in The Playhouse, Portrush, it will be followed by a screening of 3 short films, all made in N Ireland with at least one of the directors planning to attend for a Q&A. There is no charge for this evening and all are welcome. Thank you Basic Income Ireland! Thursday 23rd Feb: Embrace of the Serpent 2015 (125mins) Columbia. Stunningly shot in black and white, this journey takes us deep into the Amazon in search of a sacred healing plant with a shaman, the sole survivor of his tribe and two European scientists whose visits span 40 years. Thursday 9th March: The Fits 2015 (72 mins) USA. This multi award winning drama tells the story of 11year old boxer Toni (Royalty Hightower) who works out at the gym where a dance troupe practice and despite herself she joins the group, trying to fit in at a time when the group are mysteriously afflicted with fits. Thursday 30th March: Hunt for the Wilderpeople 2016 (101mins) New Zealand. A rebellious kid (Julian Dennison) is sent to a foster family ( Sam Neill and Rima Te Wiata) in the sticks where his interest in rap and haiku seem irrelevant but find their place in building relationships with his uncle. This is a cracker – really funny! Nigel (our projectionist+) has teamed up with Intofilm and will be showing two films for schools in March. This is a great opportunity as Nigel had been keen to set up a PFT for kids and Intofilm will do all the groundwork leaving us to simply show the film on the day. Coincidentally, Ulster University have secured a bit of funding to run about six family films during April-June on Saturdays, the dates and titles are yet to be decided but the idea is that the Uni shows films along with PFT as a way of reaching families who wouldn't identify with the Uni normally. We are delighted to announce our showing on 14th March 2016, The Survivalist. This film will be followed by a Q&A from BAFTA nominated director, Stephen Fingleton. Showing at The Playhouse only 2 days after it's official release! We have had projector difficulties but are delighted to announce our February showing on the 4 time Oscar winning No Country For Old Men. We have had some licensing issues in the past but after exhaustive emails we have be told that Star Wars is now not available. How a small theatre in Portrush can possibly have an impact on the release of the latest Star Wars film we have no idea. It is what it is and we are currently seeking an alternative for December. We have had some licensing issues with Women on the Verge and John was almost on the verge! It is all sorted now and we are pleased to confirm out next showing of Women in the Verge of a Nervous Breakdown on 5th November, doors open at 7pm with the film starting at 7.30pm. After an excellent first year we will hold our AGM at The Playhouse just prior to the screening of The Stranger 21st September 2015. After a very busy month showing both Road and RUSH we are now planning our summer progamme. Galaxy Quest, The Boxtrolls and Hoodwinked have June, July and August sorted! Something for all the family. We had a hugely successful showing of ROAD. Our very own Liam Beckett was the subject of he Q&A afterwards which we ran in the Cinema itself. It was a great evening and thanks to everyone for their hard work in making this such a successful event. After a meeting with members of Vintage Japanese Motorcycle Club NI we now plan to show Road during the NW200 week, Friday 15th May. This film is a great delebration of Irish Road Racing focussing on the Dunlop family, their triumphs and tragedies. There will be a q&a afterwards and we are hoping to have some very special guests for that. It will be another great night! We had a great turn out last night for True Grit despite the weather. It seemed like it was a movie which was enjoyed by everyone. Wh had a great Q&A session in the bar afterwards with Prof. Martin McLoone who did a brief talk prior the film. The Q&A session developed very quickly into general film discussion, likes, dislikes, wish lists and the like. A great way to round off a great evening. Website updated to relfect next film and previous showings. We had an astonishing turnout for our opening night, a full house! Guests included Mrs. Thatcher no less! A great night was had by all with a rapturous applause at the end of PRIDE. Feedback has been incredible and we are taking a well earned rest before beginning to organise for True Grit! We will upload photos as soon as they are available. Guest for our opening night! Robert Kincaid, an activist from the group ‘Lesbians and Gays Support the Miners’ is coming to our Opening Night! He travelled to the Welsh Valleys with Mark Ashton to give their support and show solidarity with the miners. Robert will give us a little insight into what it was like to be there and to be a part of the extraordinary story as told in PRIDE! There will also be a Q & A session in the bar afterwards. Read more about this extraordinary story here. A format for the forum has been finalised. I have tried to give it the "feel" of the main site and hopefully have succeeded. I have resisted the temptation to "spruce it up" with all sorts of modifications so it is quite a basic forum. Hopefully those with an interest in our group and a general interest in films will make use of it. The forum is up an running. I'm trying to make it look and feel more like the main site so it will periodically change. Feel free to register using the link above. Although the website is up and running the servers are still having problems with the database required fopr the forum! Hopefully it will be running in the next few days. Our website is now up and running! Believe it or not the recent typhoon in Thailand effected the server so development was slow and they have only just become stable. We hope it reflects the dynamic feel we have for Portrush FILM Theatre and we hope you like it! The committee today has been informed that we have been given the rights to show Pride. Excellent news! 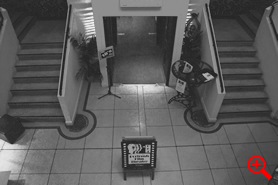 "Run by volunteers, Portrush Film Theatre is a non-profit, community based cinema group. Our aim is to promote greater appreciation of, and enthusiasm for, film culture in the local community by showing a diverse range of Irish , British and World cinema in a warm and friendly atmosphere ". 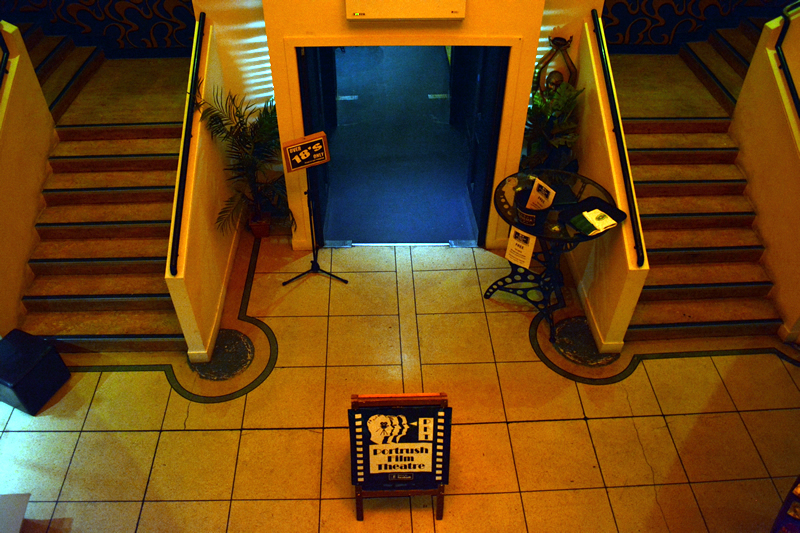 Using The Playhouse with it's unique Art Deco design and long history of cinema we boast a well stocked bar and traditional sweet sales at every show. Portrush FILM Theatre is a welcome alternative to the multiplex way of enjoying films and puts the old fashioned excitement back into "Movie Night"! A "colourful" past is one way to describe it but did you know it opened in 1939? Construction began in the 1930's and The Majestic Cinema opened on 7th April 1939 (Good Friday). It had seating for 792 in stalls and circle levels and the proscenium was 40 feet wide. Initially operated by an independent operator, it was later taken over by the Curran Cinemas chain. Join to our mailing list to receive updates. Locally-made Bad Day For the Cut came to Portrush on the second night of it's tour of independent film groups and had our audience gripped right to the end. Nigel O' Neill's performance never falters as he emerges from mild-mannered farmer living with his mother, to become a man bent on revenge and stopping at nothing to achieve it. A cracking story from Chris Baugh and Brendan Mullin. If you had chosen to watch NI get beaten by Switzerland 1-0 due to the 'worst penalty in history' instead, then poor you! THE STORY: Early 1953, Moscow, and Joseph Stalin is found dead in his office. The senior members of the Council of Ministers scramble to maintain order, weed out the competition, and, ultimately, try to take power. THE STORY: Writer James Baldwin tells the story of race in modern America with his unfinished novel, 'Remember This House'. THE STORY: A romance sparks between a young actor and a Hollywood leading lady. THE STORY: In a totalitarian future society, a man, whose daily work is re-writing history, tries to rebel by falling in love. THE STORY: Three decades after the Empire's defeat, a new threat arises in the militant First Order. Stormtrooper defector Finn and spare parts scavenger Rey are caught up in the Resistance's search for the missing Luke Skywalker. THE STORY: A working girl tears through Tinseltown on Christmas Eve searching for the pimp who broke her heart. THE STORY: A Brooklyn teenager feels his only chance to succeed is as the king of the disco floor. His carefree youth and weekend dancing help him to forget the reality of his bleak life. THE STORY: Lion cub and future king, Simba, searches for his identity. His eagerness to please others and penchant for testing his boundaries sometimes gets him into trouble. THE STORY: After losing his mother, a young boy is sent to a foster home with other orphans his age where he begins to learn the meaning of trust and true love. THE STORY: A middle-aged Irish farmer, who still lives at home with his mother, sets off on a mission of revenge when the old lady is murdered. THE STORY: Young Norman Babcock has the ability to speak with the dead and often prefers their company. Norman receives word from strange Uncle Prenderghast that a curse on their town is real and about to come true -- and that only Norman can stop it. Norman must summon all his courage and compassion and push his paranormal abilities to the limit to save his fellow townspeople. A stunning documentary about Padraig O'Malley, renowned for his ability to bring opposing sides together, to lay down the groundwork for compromise and mediation. But he also has his own internal conflicts and struggle. He is an addict — an alcoholic who has lost the memory of entire periods of his life’. Amazingly, Padraig will be with us for a question and answer session after the film!! In a dangerous Islamic city, on the fringes of a major war-zone, an American is staring down an axis of evil. Surrounded by sinister foreign plotters and malfeasants, should he stand by idly or intervene, committing murder to protect his beliefs? There, in a nutshell, is the plot of any number of self-important movies about the fight against terror (films such as Rendition, The Kingdom, Lions for Lambs). But this is also the story of one of the best-loved films in all of cinema. Spending the summer at a Catskills resort with her family, Frances "Baby" Houseman falls in love with the camp's dance instructor, Johnny Castle. But this film isn't about plots is it? It's about dancing. Adventure, Drama, Family Four children (the Swallows) on holiday in the Lake District sail on their own to an island and start a war with rival children (the Amazons). In the meantime, a mysterious man on a houseboat accuses them of a crime they did not commit. Animation, Adventure, Family Disney animation inspired by Rudyard Kiplings "Mowgli" story. Mowgli is a boy who has been raised by wolves in the Indian jungle. When the wolves hear that the fierce tiger, Shere Kahn, is nearby, they decide to send Mowgli to a local "man tribe". On his way to the village, Mowgli meets many animal characters in this musical tale. When Shere Kahn learns of Mowgli's presence, he tracks him down. Documentary Mad' Mary McArdle returns to Drogheda after a short spell in prison - for something she'd rather forget. Back home, everything and everyone has changed. 'A date for Mad Mary' is a tough and tender story about friendship, first love, and letting go of the glory days. Documentary The tender, heartbreaking story of a young man's struggle to find himself, told across three defining chapters in his life as he experiences the ecstasy, pain, and beauty of falling in love, while grappling with his own sexuality. Documentary Explores the beloved football rock and roll star in a way you have never seen him before, celebrating his prowess on the pitch, revealing his flaws, and his tragic final years. Adventure, Drama Two counterculture bikers travel from Los Angeles to New Orleans in search of America. Comedy Two teenage boys cycle 160km on stolen bikes pursued by police to find a missing bale of cocaine worth 7 million euro. Set around the real event of Ireland's biggest cocaine seizure in 2007 of 440 million euro. Drama A national manhunt is ordered for a rebellious kid and his foster uncle who go missing in the wild New Zealand bush. Starring: Royalty Hightower, Alexis Neblett, Antonio A.B. Grant Jr. Drama - While training at the gym 11-year-old tomboy Toni becomes entranced with a dance troupe. As she struggles to fit in she finds herself caught up in danger as the group begins to suffer from fainting spells and other violent fits. Adventure, Drama - The story of the relationship between Karamakate, an Amazonian shaman and last survivor of his people, and two scientists who work together over the course of 40 years to search the Amazon for a sacred healing plant. Thriller - A middle aged carpenter who requires state welfare after injuring himself, is joined by a single mother in a similar scenario. Thriller - An insane general triggers a path to nuclear holocaust that a war room full of politicians and generals frantically try to stop. Documentary - All the raw energy and excitement of the 1970s punk rock scene in Northern Ireland is on display in this cracking music documentary. Documentary - From Minneapolis to Seattle: Ride the Rails with Beargrease in the shadow of the "American Dream". Thriller, Romance, Horror - Residents of a worn-down Iranian city encounter a skateboarding vampire (Sheila Vand) who preys on men who disrespect women..
Sci-Fi, Documentary - Widely seen as one of the most influential films in cinema history, Georges Méliès’ ground-breaking 1902 movie ‘A Trip To The Moon’ continues to delight thanks to its lavish scenery, spectacular visuals and innovative special effects. Followed by the documentary ‘The Extraordinary Voyage’ which chronicles the cinematic journey of this iconic film. Family Animation - An eccentric chicken farmer, with the help of his granddaughter, trains his mischievous dog Oddball to protect a penguin sanctuary from fox attacks in an attempt to reunite his family and save their seaside town. Documentary - Over 8 years, a fisherman puts himself, as 'David against Goliath', in the heart of the new reform of the Common Fisheries in Brussels, to try to understand and change the system that took everything from him. Biography - Drama - Music - A Los Angeles journalist befriends a homeless Juilliard-trained musician, while looking for a new article for the paper. Animation - Family - Fantasy - Ben, a young Irish boy, and his little sister Saoirse, a girl who can turn into a seal, go on an adventure to free the faeries and save the spirit world. Drama - Sci-Fi - Thriller - In a time of starvation, a survivalist lives off a small plot of land hidden deep in forest. When two women discover his farm, his existence threatened. Crimew - Drama - Thriller - Violence and mayhem ensue after a hunter stumbles upon a drug deal gone wrong and more than two million dollars in cash near the Rio Grande. Music - Documentary - The story of Amy Winehouse in her own words, featuring unseen archival footage and unheard tracks. This is the Amy Winehouse few of us ever got to witness, radiating cheeky self-confidence and finding joy in sharing her considerable gifts. Music - Drama - A promising young drummer enrolls at a cut-throat music conservatory where his dreams of greatness are mentored by an instructor who will stop at nothing to realize a student's potential. Horror - A family heads to an isolated hotel for the winter where an evil and spiritual presence influences the father into violence, while his psychic son sees horrific forebodings from the past and of the future. Spanish - Subtitles - Comedy - A woman's lover leaves her, and she tries to contact him to find out. She confronts his wife and son, who are as clueless as she. Meanwhile her girlfriend is afraid the police are looking for her because of her boyfriend's criminal activities. They talk to a female lawyer, who turns out to be the lover's new lover, and everyone's path keeps crossing each other's in a very complicated and confusing manner. Irish - Documentary - An Englishman living in a 10 x 5 foot hovel on a remote Donegal island, dies suddenly, leaving years of dairies and notebooks. Did no-one on the island really know who the stranger was? Animation - Comedy - Family - Eggs, an orphan, lives with the Boxtrolls. When evil Archibald Snatcher hatches a plan to get rid of the pretty harmless beings, Eggs and his friend Winnifred, devise a daring plan to save the Boxtrolls from extermination. Action - Comedy - Sci-Fi - The alumni cast of a space opera television series have to play their roles as the real thing when an alien race needs their help. Action - The merciless 1970s rivalry between Formula One rivals James Hunt and Niki Lauda. Documentary - Brothers addicted to speed, at any price. Motorcycle road racing is the most dangerous of all motor sports. One in which men compete at speeds of up to 200 miles per hour on closed country roads. This is the dramatic and poignant story of two sets of brothers from Northern Ireland who have been united by success and by tragedy. Adventre - Comedy - The adventures of Gustave H, a legendary concierge at a famous hotel from the fictional Republic of Zubrowka between the first and second World Wars, and Zero Moustafa, the lobby boy who becomes his most trusted friend. Drama - The mixed race daughter of a Royal Navy Admiral is raised by her aristocratic great-uncle in 18th century England. Western - Action - Fourteen-year-old Mattie Ross joins an aging U.S. marshal and another lawman in tracking her father's killer into hostile Indian territory. Comedy - Drama - U.K. gay activists work to help miners during their lengthy strike of the National Union of Mineworkers in the summer of 1984. Sci-Fi - Drama - A troubled teenager is plagued by visions of a large bunny rabbit that manipulates him to commit a series of crimes, after narrowly escaping a bizarre accident. We will not sell, trade, give, etc., the statistics that we collect on our site to any third party. The data that we collect is not used for marketing purposes in any way. The data that we collect is used solely for our forum and contact form. Be assured that safeguarding the contents of our website traffic is our priority. Our site collects information in several ways. If you register on our forum you are required to complete certain details. We only require a valid e-mail address to verify your identity. You may choose to provide other details on the forum such as your date of birth if you wish. These details are kept on the server and are encrypted. DO NOT send anyone your hoem address via any forum unless you know exactlry who you are sending ot to. We will, if required by law disclose information in special cases where there is reason to believe that disclosing this information is necessary to identify, contact or bring legal action against someone who may be violating our terms and conditions of use or who may be causing injury or interference with our rights, property, our customers or anyone user of our site who could be harmed by such activities. security. This site has security measures in place to protect against the loss, misuse and alteration of the information under our control. A password must be entered to log into our forum and you will be required to enter your username and password to access the forum. All personal information is fully encrypted during all transactions. Please note, however, that no data transmission over the Internet is completely secure. As a result, while we endeavour to protect your personal information, we cannot ensure the security of any information you provide to us and you transmit such information to us at your own risk. Once we receive your transmission we endeavour to ensure the security of your personal information on our systems. Please note that we will never ask for any personal information by email. If you get an email of this kind it is not from us! If any user asks you for personal information let us know immediately. If you wish to correct, update or otherwise modify the information that you have provided to us please visit the Profile section in the forum and correct, update or modify the relevant information. For 40 years it operated as a successfully and was taken over by the Rank Organisation in the 1950’s. Initially, it was very successful but it began to suffer a decline until it closed in 1970. The building lay unused for several years, then in 1977, it was re-opened as The Playhouse Cinema by an independent operator. The seating capacity was reduced to 360, using the former circle only and the former stalls werechanged and used as an amusement arcade. 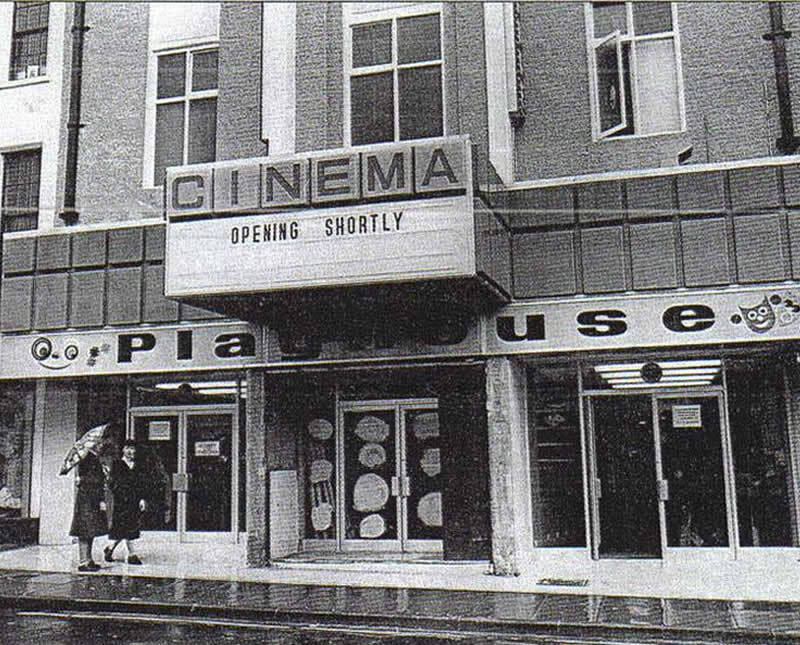 It had closed again by 1980 however following a further re-furbishment The Playhouse Cinema re-opened in 1993 and in the Summer of 1997 a second 50-seat screen was created in the former rear stalls area. The the former circle screen now seated 315. It was closed in 2006, but was re-opened by the Movie House Cinemas chain in April 2007. However, by May 2008 it had closed once more. 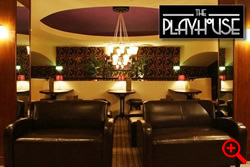 In early December 2008 major plans were proposed to revamp the building into a combined bar, cinema and theatre and with AJM Event Management Ltd. at the helm The Playhouse enjoyed a prosperous period for around 3 years where they hosted a myriad of top names including The Hothouse Flowers, The Outcasts and Ash as well as many top tribute bands. Although it did not actually close the past 2 years has seen limited use. 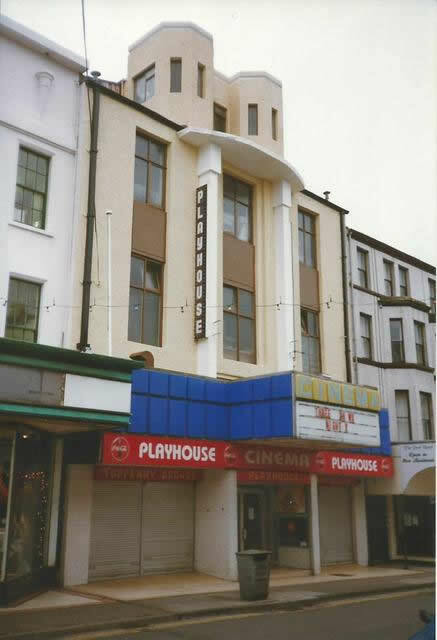 A number of groups presently use The Playhouse and of couse it is an ideal place for Portrush FILM Theatre. Recent refurbishment means we can use the large cinema for our showings and with recently upgraded sound system and projector we promise you will enjoy an evening with us! With it's amazing Art Deco architecture still intact, The Playhouse is a wonderful building. Despite extensive refurbishment over the years and recent modernisation, improvements have been carried out in such a way that The Playhouse has remained true to it's original, 1930's design.